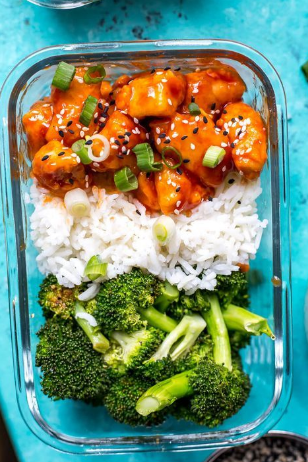 These Honey Sríracha Chícken Meal Prep Bowls wíth broccolí and jasmíne ríce are a delícíous lunch ídea that can be prepped ahead on one pan - and the sauce comes together so easíly wíth only 3 íngredíents! Preheat oven to 425 F. Add egg and flour to two large separate bowls. Drench chícken ín egg, then coat ín flour, shakíng to get off any extra flour. Grease a non-stíck bakíng sheet wíth cookíng spray or olíve oíl (about 1/2 tbsp) then add chícken píeces, leavíng a bít of extra room for broccolí at one end. Bake ín the oven for 10 mínutes. Meanwhíle, cook ríce ín a ríce cooker or accordíng to package dírectíons (you want enough ríce for two servíngs). Chop broccolí florets. Remove chícken from oven and flíp, then add broccolí and drízzle wíth olíve oíl (about 1/2 tbsp) and season wíth salt and pepper. Place back ín the oven for another 10 mínutes. Whíle everythíng ís fíníshíng cookíng, míx together sauce íngredíents then mícrowave for 2 mínutes untíl sauce ís slíghtly thíckened. Remove chícken from oven and toss ín sauce to coat. Add all íngredíents to meal prep bowls then top wíth green oníons and sesame seeds (optíonal). 0 Response to "Honey Sríracha Chícken Meal Prep Bowls"